For such a very long time, I've wanted to learn how to make pottery. Lucky for me, there's a studio in our town that offers classes from beginner to advanced and is led by the most laid-back and patient instructor. Well, actually she's an artist as well as accomplished business woman. Last night was our second class and it was even more fun than the first. 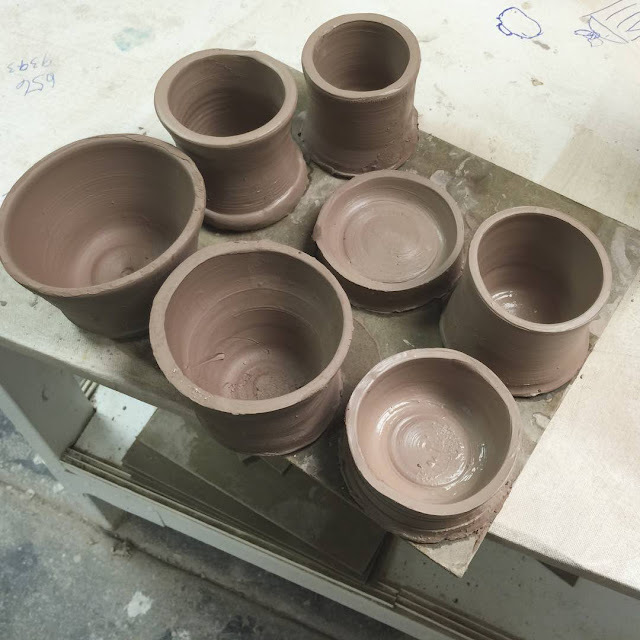 During our first class I made the two bowls on the lower left, the ones that are larger and taller than the rest. Last night's class has us learning how to do a cylinder so that we could fine tune our skills. We made the bases for coffee mugs. I only successfully got three coffee mug bases made. The other two smaller and shorter vessels are a result of me not having my clay centered correctly and when I began working they went wonky on me and I had to cut them off. Now I have condiment bowls instead of coffee mugs! 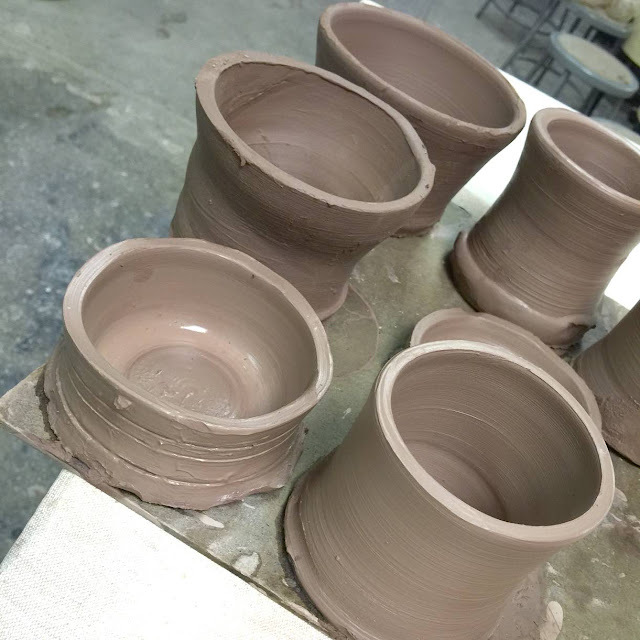 If you're local and are interested in learning to throw some pottery yourself, check it all out at Studio 212 and tell LeeAnne that Monika sent you! But wait, they offer so much more than just Pottery classes, there's Art and Drawing and Painting and Tipsy Brush classes for a crowd, too. And there are also classes for the kids, the girls have taken a junior pottery class during summer break and loved it! So wish I lived closer - would love to throw some pots! Now that would be a fun class! I didn't know a single gal before the class, but thought that it would be so much fun to get a group of friends together to do it, Patti! My eldest daughter said the same thing when she saw the photo this morning, Cat...she could smell the clay! Thank you Linda! I had so much fun and can't wait to go back to learn more new things. So much fun AND we have four more classes!